An ISIS-claimed bombing in a Syrian restaurant on Wednesday took the lives of an Army Green Beret and a former Navy SEAL, along with a Navy linguist and an American contractor working as interpreter. This was the deadliest incident since combat operations began on the ground in Syria in 2015. Newport Brain Research is the company behind the innovation of Magnetic EEG/ECG-guided Resonant Therapy, or MeRT, that’s helping U.S. Special Operations Forces personnel recover from the effects of PTSD. Though FDA clinical trials are still underway, it is potentially one of the biggest breakthroughs in mental health treatment since the EEG. The House Armed Services committee has added 18 new members, with more veterans on this year’s committee from the wars in Iraq and Afghanistan than ever before. These new members also bring the committee to its largest number of female veterans to date. An audit released by the U.S. Department of Veterans Affairs Office of Inspector General reviewed the Veterans Benefits Administration’s oversight of education and training. The report showed that federal tuition and fee payments made through the Post-9/11 GI Bill have gone to “ineligible or potentially ineligible” schools. ScoutComms’ new client HR Certification Institute is rolling out a program to benefit the veteran and military community. As the nation’s leading HR certification company, this program presents a significant opportunity for active duty and veterans to gain a valuable professional certificate at a reduced cost. 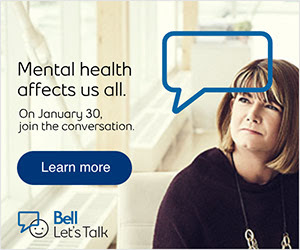 us in the conversation by posting a photo to raise awareness and funds toward mental health initiatives by using the hashtags #BellLetsTalk and #changementalhealth. Since 2011, Vets4Warriors has been providing the veteran and military community with 24/7, confidential peer support and resource connection services. All 45 of its employees are veterans or a member of the military community, meaning they are able to relate and connect better with callers because of similar experiences and backgrounds.